This week’s list of data news highlights covers March 23-March 29, 2019, and includes articles about AI detecting exoplanets and drones delivering medical supplies. Researchers from Google and multiple U.S. universities discovered two exoplanets—planets outside our solar system—using a convolutional neural network. 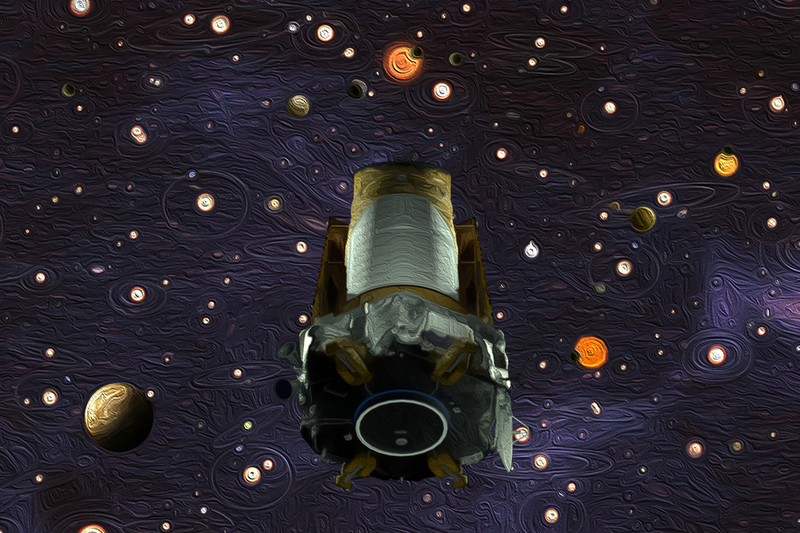 The network helped the researchers find the planets, which are both over 1,200 lightyears away, by analyzing data from the Kepler space telescope. The researchers trained the network on 22,000 images of deep space enabling it to identify exoplanets with 98 percent accuracy. Researchers from the University of Nottingham in the UK have developed an AI system that predicts the risk of a person dying prematurely more accurately than standard prediction models. The researchers tested the system on the UK Biobank, a database containing health data from than 500,000 people over a span of 10 years, finding that the system correctly predicted 76 percent of the individuals who died during the decade. The AI system identified air pollution, alcoholic intake, and job-related hazards as critical factors for predicting mortality. Machine learning tools have helped Anheuser-Busch cut the number of its deliveries that are late by 85 percent and reduce the number of miles its delivery vehicles travel by 13 percent. The tools are from Wise Systems, a company that provides autonomous dispatch and routing software, and adjust drivers’ schedules based on factors such as weather, traffic, and busy loading docks. The tools can also spot patterns in the time it takes to deliver specific goods depending on the time of day, the customer, and the delivery person. Estonia is developing an AI “robot judge” to resolve small claims disputes involving less than €7,000. The AI judge, which could reduce the backlog of cases and provide judges more time to work on bigger cases, will analyze legal documents to make legally binding decisions. Individuals involved in the small claims disputes will have the option to appeal the AI judge’s decision to a human judge. Researchers from Stanford University have developed a neural network that helps autonomous vehicles make turns at high speeds, which could help the vehicles avoid collisions. The researchers trained the network on both simulated and real driving data, including testing data from a race track covered with ice and snow, to teach the system how to drive on both low and high-friction surfaces. The researchers found that an autonomous Volkswagen GTI equipped with the neural network could make turns at 26 miles per hour within 50 centimeters of its desired turning path. Delivery robots have delivered an extra 1,500 breakfast orders to students at George Mason University since the school introduced the robots at the end of January, suggesting that fewer students are skipping breakfast. George Mason is also analyzing data from the robots to learn how students use their meal plans, such as where, when, and what students are eating, to possibly change how they serve their students. Researchers from Stanford University and Intermountain LDS Hospital in Utah have developed an AI system to detect how often and how long patients in the intensive care unit (ICU) move during the day. Movement can accelerate healing and prevent muscle atrophy in patients, and the researchers developed computer vision algorithms to analyze three-dimensional silhouette data from depth sensors. The system accurately detected mobile activity 89 percent of the time. UPS has partnered with drone startup Matternet and WakeMed hospital in Raleigh, North Carolina, to deliver medical samples using drones. The drones are replacing courier cars for delivery, which were subject to traffic delays, and will fly along a predetermined route between the hospital and a pathology lab to deliver samples, including blood samples. Oregon has created a statewide database containing anonymized student and employment records from 3.8 million Oregonians. The state will provide researchers access to the database to identify trends, which could help policymakers make informed decisions about how to improve Oregon’s education system. Researchers from MIT, Harvard University, and Tsinghua University in China have developed a federated machine learning model, which trains the model locally without sending individuals’ data to a central server, to predict hospital patient stay times and mortality. The researchers trained their model on the data of 280,000 patients from more than 100 hospitals, and the model categorized the data into communities based on shared diagnoses and locations. Federated models can alleviate some privacy concerns that make it difficult to share and aggregate data from multiple sources by keeping the data at its source.